businessgateways partnered with Gartner in 2017 to enhance their business model and to meet international benchmarks in the procurement domain. Gartner is the world's leading information technology research and advisory company. Gartner delivers technology-related insights necessary for its clients to make the right decisions. Gartner's comprehensive suite of services delivers strategic advice and proven best practices to help clients succeed in their mission-critical priorities. In its endeavour to equip JSRS Registered Supplier Companies with country level intelligence and support them expand their business boundaries, businessgateways associated with Oxford Business Group (OBG) in August 2015. Through this unique partnership JSRS Registered Companies get the opportunity to draw on OBG’s wealth of online data and analysis. If you are a Registered JSRS Company, you can access online Country Reports of 40 countries published by Oxford Business Group. These reports are of vital importance for first level economic information of far fletched geographies. 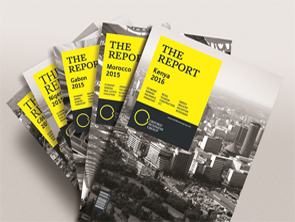 With each country’s report priced at GBP 175, JSRS suppliers benefit from free online access. OBG is a London-based publishing, research and consulting company. It operates in many of the world's fastest growing markets, offering internationally acclaimed intelligence on regions that are shaping the future balance of economic power.